Baba ghanoush, the famous smoky eggplant dip, and za’atar, a tangy spice blend, are both recurrent sides in Middle Eastern cuisine. Combined with the sweetness of pumpkin in this salad the smoky, zesty savoury flavours really sing. 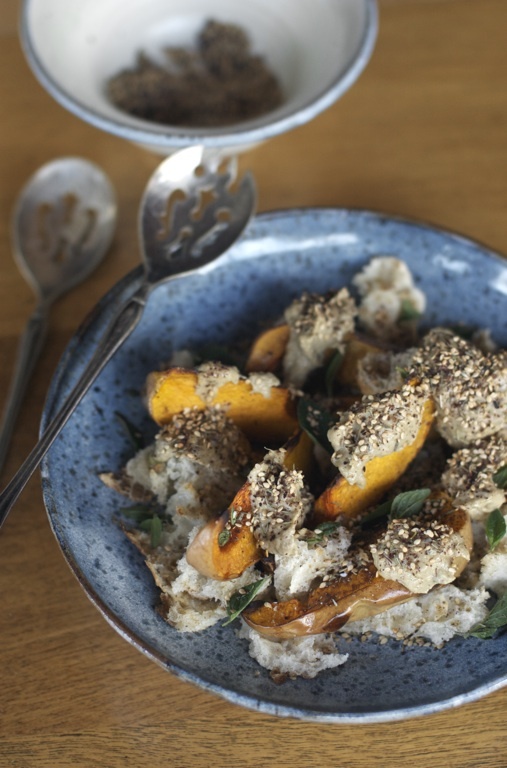 Sesame is an integral ingredient in both baba ghanoush and za’atar: these recipes use the unhulled seeds and tahini paste to amp the nutrition as unhulled sesame seeds are a particularly great source of calcium. 1. Preheat oven 200ºC. 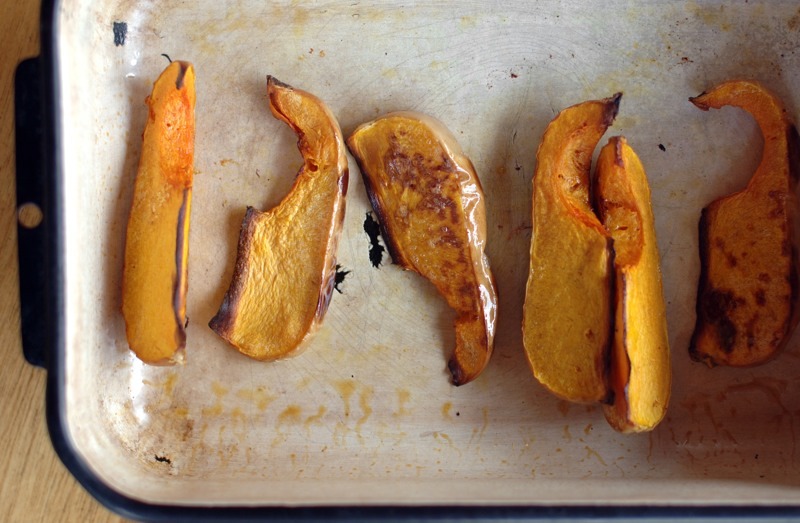 Lay pumpkin in baking tray, rub with half the oil and sea salt to season. Roast 30 – 40 minutes, until tender and golden. Lay bread on another tray, lightly brush with remaining oil and a little salt. Bake for about 10 minutes, until golden. 2. For baba ghanoush char eggplant over the open flame of a gas burner for about 10 minutes, turning frequently. Remove to baking tray, prick a couple of times and roast 30 minutes, until completely soft. Cool then scoop flesh into bowl with remaining ingredients and briskly whisk with a fork until the mixture is a rough paste. 3. For za’atar, toast sesame seeds in a dry saucepan over medium heat until golden and aromatic. Cool then combine with remaining ingredients in a small jar. 4. To assemble salad lay pumpkin and bread on a platter. Dollop generous spoonfuls of baba ghanoush on top and garnish with 2 tablespoons of za’atar and the oregano leaves.